Design of waves & shellfish, excellent inlaid carving! Masterpiece! KOZUKA-handle for samurai KATANA,NANAKOJI,inlay,Mt.FUJI,cloud,Edo,copper/mb036/ . in technique of the inlay to NANAKOJI pattern. that Mount Fuji rising on a cloud was drawn. Therefore there seem to be loss and a trouble of delayed arrival. Fuchi: 37.5x21x13 mm. Kashira: 33.5x16.5x8 mm. Material: iron. Design of samurai warrior, great openwork carving! Age:Showa period. We don't declare the low value or mark as "gifts". Fuchi: 38.5x24x11.4 mm. Kashira: 33.5x18x8 mm. Material: copper. Design of toad hermit, excellent thin carved! 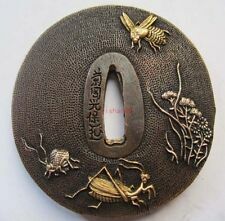 Age:Edo period. Fittings material: Shakudo(Alloy of Copper with Gold), Copper, Gold. We don't declare the low value or mark as "gifts". from Japan. Design of cloud & dragons, excellent plow out carving! Fuchi: 38x20.5x11.5 mm. Kashira: 34.5x16.5x8 mm. Motif:KIRI Leaves. Age:Edo period. We don't declare the low value or mark as "gifts". from Japan. 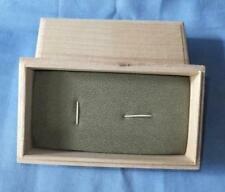 Size: 72.1 x 71.3mm. Described in the photos. Signature:Rai KANEFUSA. 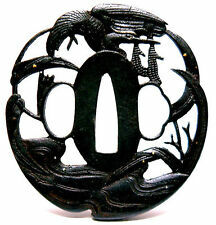 Age:mid Edo period. Spear full length: 316mm. Spear head length: 110mm. We don't declare the low value or mark as "gifts". Shirasaya full length: 672mm. Age:Edo period. We don't declare the low value or mark as "gifts". from Japan. Size: about 230mm. Described in the photos. Age:Edo period. Fuchi/Kashira motif:Rabbit. We don't declare the low value or mark as "gifts". from Japan. Signature: 算経＝　Sankei [Kao]. It is a very good "Neri tsuba". Age : Later Edo era. A beautiful pattern like a water surface looks better. Material : Iron. Fuchi: 38.5x21x11 mm. Kashira: 35x17x11 mm. Age:Edo period. work byMINO School. We don't declare the low value or mark as "gifts". from Japan. 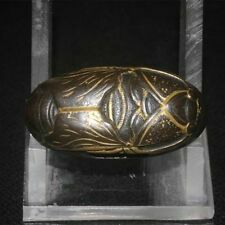 Material: Water Buffalo horn, Urushi. Age:Edo period. We don't declare the low value or mark as "gifts". from Japan. 明珍式部＝Myochin Shikibu. 紀　宗察＝Kino Muneakira. Myochin ki muneshige. It is a "Daito tsuba". Picture= The month and Japanese pampas grass. Age : Middle era. Size : Length 8.4cm Width 8.1cm Thickness 0.5cm . Iron fuchi kashira. Fuchi: 38.5x21.5x10 mm. Kashira: 35x17x7 mm. Material: iron. Age:Edo period. We don't declare the low value or mark as "gifts". Material: Iron, Silver. from Japan. Size: 73.4 x 72.1mm. Described in the photos. Age:Edo period. Motif:Dragon vs Warrior. We don't declare the low value or mark as "gifts". MaterialIron forge Iron.Board eye skin design. Center hole. Condition good. (2) SAL :About 1 ～ 3 weeks. IK-75-20190417-299 . Thickness 0.19 0.5. Used by only high rank the busho etc. __Momoyama ~ Edo era. SAMURAI art __. Very Rare Japanese antique gold bow of samurai family or court noble. the bow set which the samurai family and the court noble. Excellent‼ Rare Japanese antique long spear with Raden koshirae. Raden (mother-of-pearl inlay work) & Iron. Material : Wood & Raden (mother-of-pearl inlay work) & Japanese lacquer. __ Momoyama ~ Edo era. Signed Toshinaga (Jyumyo), Gourd design! This is TSUKA for samurai WAKIZASHI. It is very interesting TSUKA for WAKIZASHI. It is thought that a price will be expensive in future. include handling fee. Therefore there seem to be loss and a trouble of delayed arrival. Motif:Phoenixes & Kiri leaves. Material: Copper, Gold. We don't declare the low value or mark as "gifts". We don't declare the low value or mark as "gifts". from Japan. Size: 82.5 x 74mm. Described in the photos.